After seeing the screenshots with new graphics, I fetched the latest FreeCiv sources and tried it out. It’s great! Now, I see that 2.1 is getting close to release date, and I can hardly wait for it. 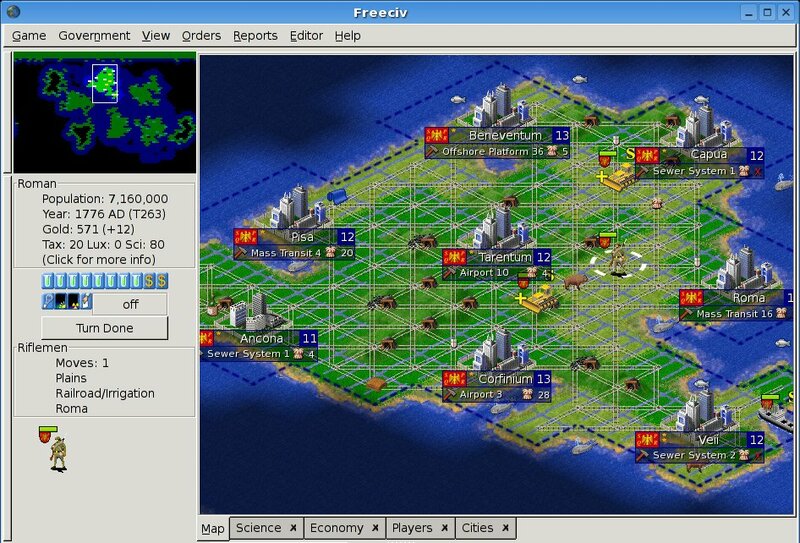 FreeCiv is one of those rare games which have very high replayablity. I think I played it a 100 times already, if not much more. New graphic, and some useful improvements like visual tech tree and stuff will probably get FreeCiv the status it deserves. When I tried to get some of my friends to play it before, they would comment that graphics is awful (although IMHO it wasn’t that bad), and they wouldn’t even try. I played the current development version with one of them, and she’s thrilled about that way everything looks and works now. I guess, all FreeCiv lacked before was some eye-candy. Well, cheers for the best turn-based strategy game ever. (At least among open-sourced ones).